ScooterBoy and ScooterGirl Ride Again! Riding down the road with the sun on our backs, a map in our pocket and the wind in our faces…can’t be beat!! ScooterBoy and ScooterGirl first came on the scene in 2004 when we visited the Greek Islands. There was no more perfect joy than scoot-scoot-scootering up and down whichever island we found ourselves on. We were easily able to explore far-flung beaches and tavernas and still be back early enough to enjoy the local sunset. 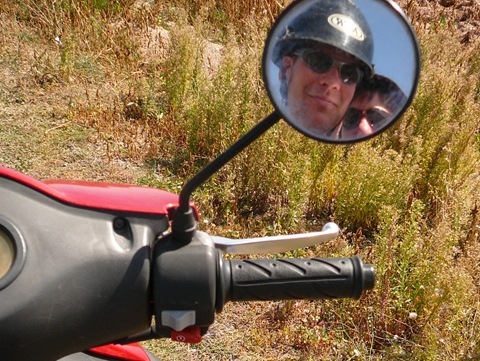 Cappadocia, in Turkey, proved to be a perfect place for ScooterBoy and ScooterGirl to once again take to the open road. Renting a scooter proved to be super easy…hand over your money and something valuable to ensure your return and there you have it. Buddy didn’t even ask if we had a license…never mind ask to see it! He gave us a map of the area…and we were off. 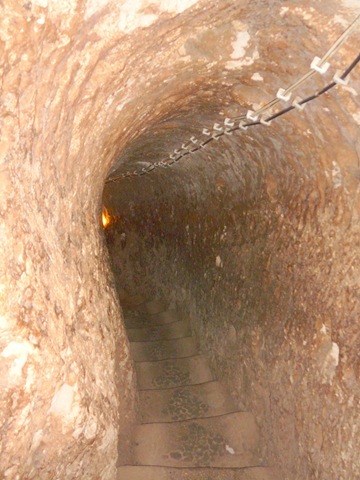 Our goal was Derinkuyu, the underground city about 30km outside of Goreme where we were staying. After a few minutes of re-acquainting ourselves with ScooterBoy and ScooterGirl and remembering the intricacies of scooter riding (lean together, don’t touch the muffler, front brake on the right…) we were on our way. We headed out, maxing out the poor scooter on the highway, past rolling hills and melon fields, fairy chimneys and rocky cliffs. 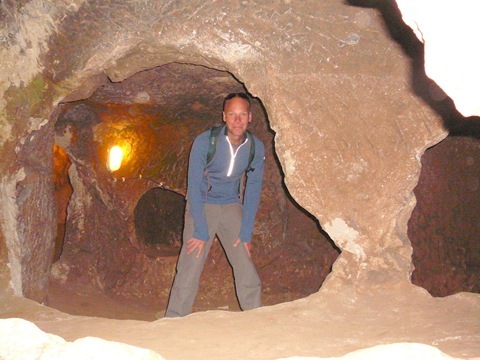 We arrived to the current village of Derinkuyu and headed down into the labyrinthine underground city. Originally build in the 7th century BC, it was expanded in the 5th – 10th centuries AD…a seriously long time ago! This city is the largest of the many that dot the Cappadocia region, burrowing 11 stories into the earth. It got cooler and cooler as we slowly descended into the city. The stairway was narrow and low-slung, the rocks making up the stairs had divots in them where thousands of feet had pounded them over millennia. Partway down, in a crevice in the wall, stood a massive disk shaped stone once used to close off the passage in the event of invading forces…it was huge and would have taken many men to close off the thoroughfare – the thought of it being closed, and being contained down there, made me feel a little claustrophobic. Suddenly, the walls opened up, and we were in a huge, multi-roomed space. There were rooms for cooking and living, rooms for storage, and rooms for animal husbandry – all the rooms a city would need to conduct daily business. It was absolutely amazing to, not only think of the work involved in excavating such a space, but to imagine living down there with 9999 other people…this city reported held 10,000 people for months at a time! The stairway continued down and down and down…we visited 8 floors all together…there was even a church carved into the bottom layer! A ventilation shaft stitched all the floors together…looking up (and down) it elicited more claustrophobic feelings as I realized how far down we were. The bright sun and enveloping heat greeted us at the surface again…I can’t imagine what it must have been like to emerge after having spent months down there. Back on the scooter we went, with the plan to stay off the highway and scoot-scoot-scooter through the country-side toward home. We passed more rolling hills, more melon fields, more fairy chimneys, more valleys, more villages and more scooter-people…all passing us with a beep and a friendly wave. 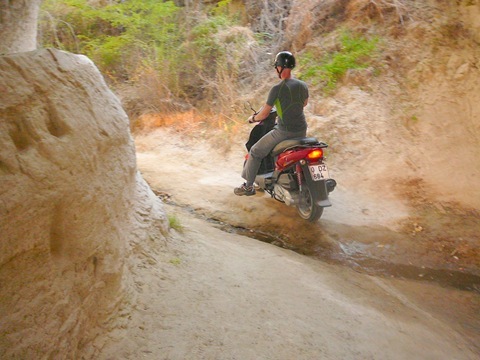 It looked like the last little bit to home was going to have to be highway again…until we spotted the dirt track that looked like it headed in the right direction…and off-road scoot-scoot-scootering was born. We passed fairy chimneys (very up close now) and bewildered hikers who must have wondered what the heck we were doing…until we got as far as we could go on a scooter and had to turn back to a more sedate, scooter friendly path. It was fun though, and a great way to spend the day. 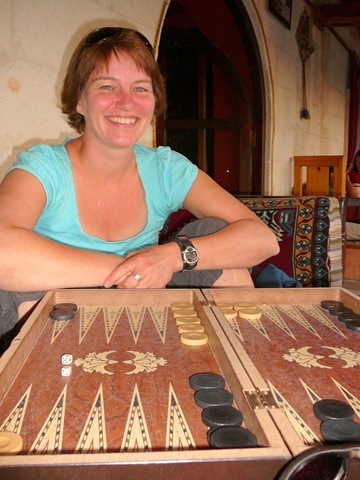 ScooterBoy and ScooterGirl finished the day back in Goreme at our favorite local watering hole, enjoying beer, backgammon and the sunset on the low slung lounge seating…what a great return! We hope to do it again soon.